It is here, with the design of the Vintage Fiesta flower vases, where Fredrick Rhead, at Homer Laughlin Pottery Company, pushed the boundries of tableware and transcended the original design elements of the Fiesta pottery line into art pottery. 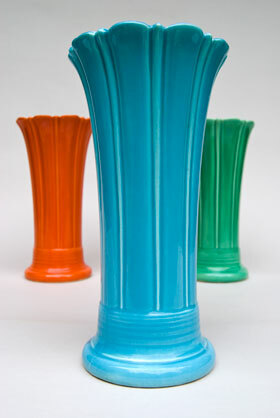 From the affordable bud vases, to the eight, ten and twelve inch flower vases, the pinnacle of art and design is reached. Produced in far less quantities than many normal tableware, it is a delight to add the whimsical bud vases and the monumental flower vases to your Vintage Fiesta pottery collection. 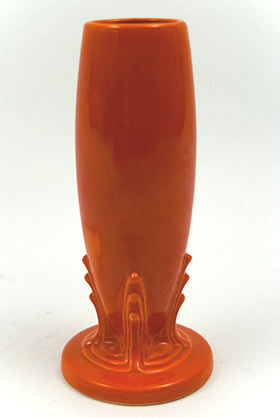 Circa 1936-1943: This example of the vintage fiesta bud vase in original red is in excellent condition, marked in the mold on the bottom "HL fiesta MADE IN USA". It is free of any damage with nice, bold, even glaze and great shine. 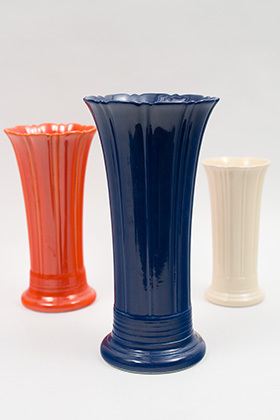 Circa 1936-1946: Part of the original Fiesta line introduced at the end of 1935, the vintage fiesta bud vase remains one of the nicest accessories available. The holloware piece was slip cast and the mold seams would have been smoothed by hand. Standinig just under 6 1/2" the base is adorned with cascading art-deco elements. Only made in the first six original colors, the bud vase is a charming addition to the dinnerware collection. This example in original ivory is in excellent condition, marked in the mold on the bottom and free of any damage with nice even glaze and great shine. 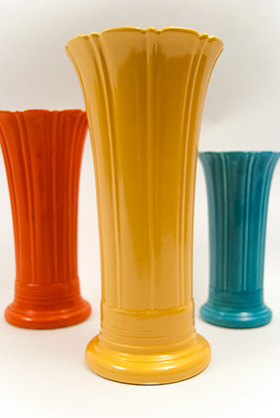 Circa 1936-1946: Part of the original Fiesta line introduced at the end of 1935, the Vintage Fiesta bud vase remains one of the nicest accessories available. The holloware piece was slip cast and the mold seams would have been smoothed by hand. 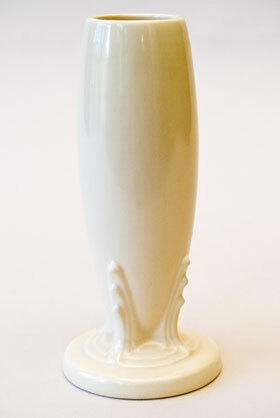 Standinig just under 6 1/2" the base is adorned with cascading art-deco elements. 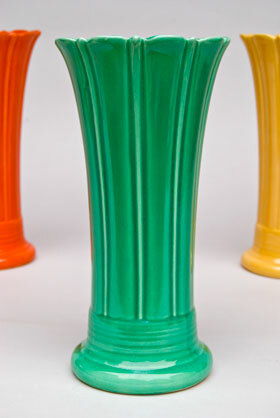 Only made in the first six original fiesta colors, the bud vase is a charming addition to the dinnerware collection. This example in original ivory is in excellent condition, marked in the mold on the bottom and free of any damage with nice even glaze and great shine. 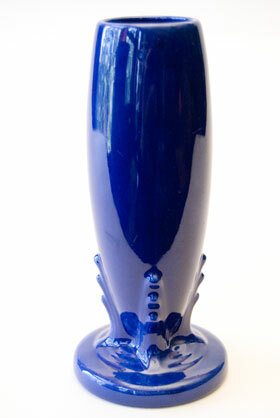 Circa 1936-1946: This example of the vintage Fiesta bud vase in original cobalt is in excellent condition, marked in the mold on the bottom and free of any damage with nice, bold, even glaze and great shine. The bud vase transends the fiesta pottery line out of the realm of standard dinnerware and showcases the art-deco lines of the 30s and 40s with great artistic detail. 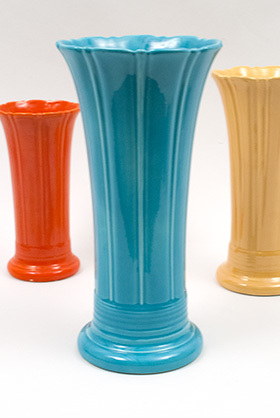 Circa 1936-1946: Part of the original Fiesta line introduced at the end of 1935, the vintage fiesta bud vase remains one of the nicest accessories available. The holloware piece was slip cast and the mold seams would have been smoothed by hand. Standinig just under 6 1/2" the base is adorned with cascading art-deco elements. Only made in the first six original colors, the bud vase is a charming addition to the dinnerware collection. 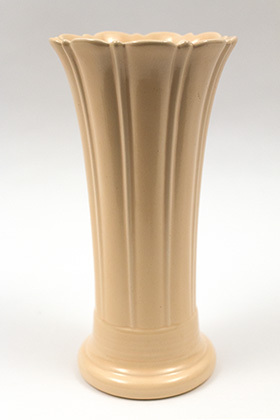 Circa 1936-1946: It is here, on the tremendous design of the original Fiesta pottery art vase, that the vellum qualities of the original ivory Fiesta glaze can be showcased. 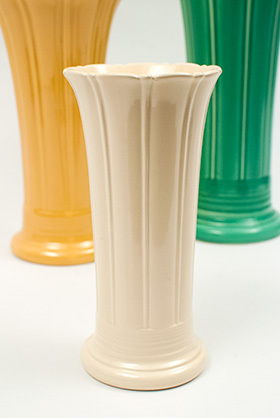 Unlike any of the other vintage Fiesta glazes, the ivory is not shiny but rather what collectors refer to as vellum. Already in use on the century pottery line, the vellum ivory brings a sophistication and calm to an otherwise fiesty and vibrant bunch. 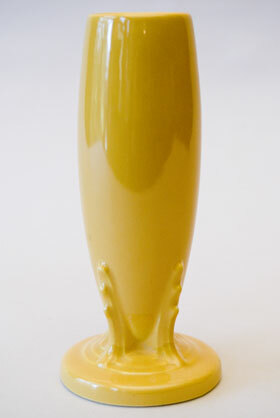 Circa 1936-1946: Yellow 8" Fiesta pottery vase in bright sunny yellow will make a fantastic addition to any collection. This example boasts a spectacular glaze with no misses or flaws. Circa 1936-1946: From the Brian Fischer Collection Long time and esteemed collector Brian Fisher left a legacy of wonderful Vintage Fiesta pottery to the Homer Laughlin collectors community. This example of his 8" Vintage Fiesta pottery vase in the original green glaze is a delightful piece in excellent condition. Circa 1936-1942: It is the red 10" Vintage Fiesta vase that trancends dinnerware and stands out as a showcase piece of art pottery. The perfect rhythm of the art deco lines highlights pottery designer Frederick Rheads vision. This example in red boasts spectacular condition and wonderful glaze. Measures 10"h x 5 1/8"w at top. Circa 1936-1942: The Vintage Fiesta flower vase will be the highlight of your tablescape, and the possibilities are endless when showcasing the most transcendent of the Vintage Fiesta pottery lines shapes. Finding the original ivory glaze vases in nearly unused condition, and as clean as the day it was made, is no easy feat. This example is delightful. Measures 10"h x 5 1/8"w at top. Circa 1936-1942: This original yellow 10" Vintage Fiesta pottery vase is in excellent condition on this hard to find vintage piece of Vintage Fiesta art pottery. This example in yellow boasts a great sunny glaze, bright and shiny as the day it was made with no human damage. 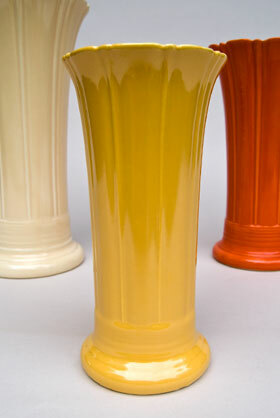 If you love the Vintage Fiesta yellow, this 10 inch vase will become a highlight in your collection or make someone a very excellent gift for a special occasion. Measures 10"h x 5 1/8"w at top. Circa 1937-1946: From the Brian Fischer Collection Long time and esteemed collector Brian Fisher left a legacy of wonderful Vintage Fiesta pottery to the Homer Laughlin collectors community. 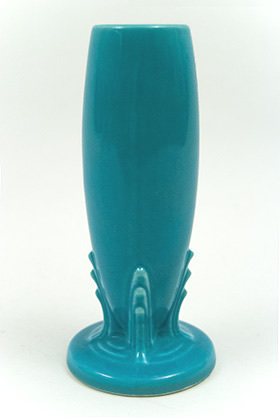 Circa 1937-1942: This 10" Vintage Fiesta fower vase is in excellent condition and boasts a great example of the bright robins egg blue that collectors love. Shiny as the day it was made, I can't speak highly enough of this example. If you love the vintage Fiesta turuquoise, this 10 inch vase will become a highlight in your collection or make someone a very excellent gift for a special occasion. Measures 10"h x 5 1/8"w at top. Circa 1936-1942: Original green 10 inch vintage Fiesta pottery vase in excellent condition. Fantastic art deco design showcases pottery designer Frederick Rhead's modern sensibilities. Measures 10"h x 5 1/8"w at top. Circa 1936-1942: The 12" Vintage Fiesta flower vase will tower above all other Vintage Fiesta pottery and grandly take the place as one of the most cherished pieces of the entire vintage line. Never made again, Homer Laughlin Potter Company really out did themselves here with this spectacular feat of hand worked American made antique pottery. 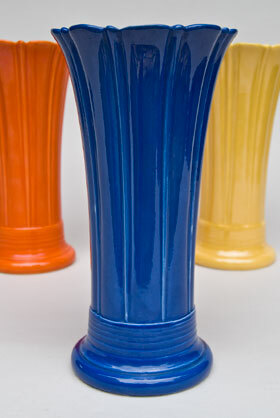 This example in the original cobalt glaze is a spectacular example. Measures 12" tall. 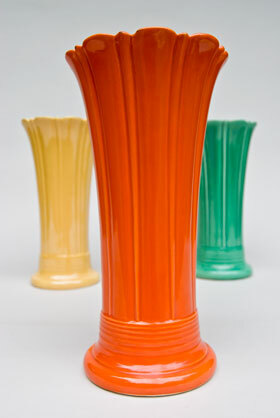 Circa 1936-1942: The twelve inch vintage fiesta vase is the pinnacle of the pottery lines artistic side. It is here, in the extravagant form of the large vase, that designer Frederick Rhead transcendes his vision into art. The extra size of twelve inch version of the vase really sets it apart from the rest and it may well be here, at the twelve inch vintage fiesta pottery vase where the line reached it's highest point. 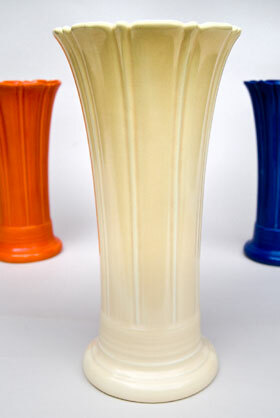 This ivory vintage version of the 12" Fiesta vase boasts spectacular condition with no chips, touchups, repairs, no use and a fantastic clean top rim without flaws. Circa 1936-1942: This red vintage version of the 12" Fiesta vase is in very good condition and is a delight to find in the highly desirable original radioactive red glaze. It is here, with the 12" fluted, vintage Fiesta vase where the pottery line trancends itself from mere dinnerware to an artistic example of an era. The art deco lines flute out in perfect proportions and abundant rings decorated the base. 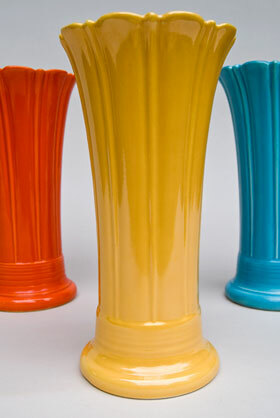 There is no other piece in the line that makes the statement that the large vintage 12 inch vase does. Circa 1937-1942: Collectors will all have their favorite colors, and favorites may jump from one color to another unexpedly. However, it is here, with the 12" Vintage Fiesta vase, where the buck stops. 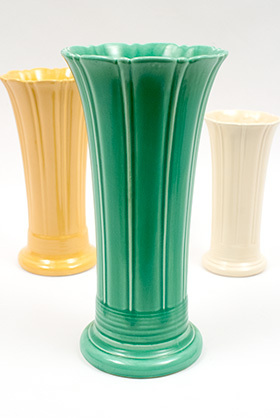 Breathtaking in its size, admirable in its level of details, and ambitious with its hand crafted construction, there is no better piece than the 12" Vintage Fiesta vase on which to celebrate your favorite original six vintage color. 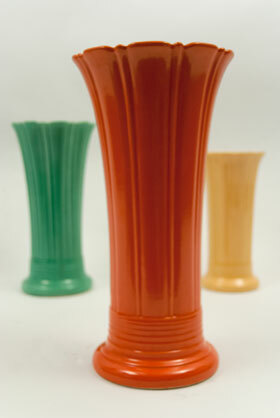 Circa 1936-1942: The twelve inch vintage fiesta vase is the pinnacle of the pottery lines artistic side. It is here, in the extravagant form of the large Vintage Fiesta vase, that designer Frederick Rhead transcendes his vision into art. The extra size of twelve inch version really sets this piece apart from the rest of the line, and it is here shere tableware is transformed into art.